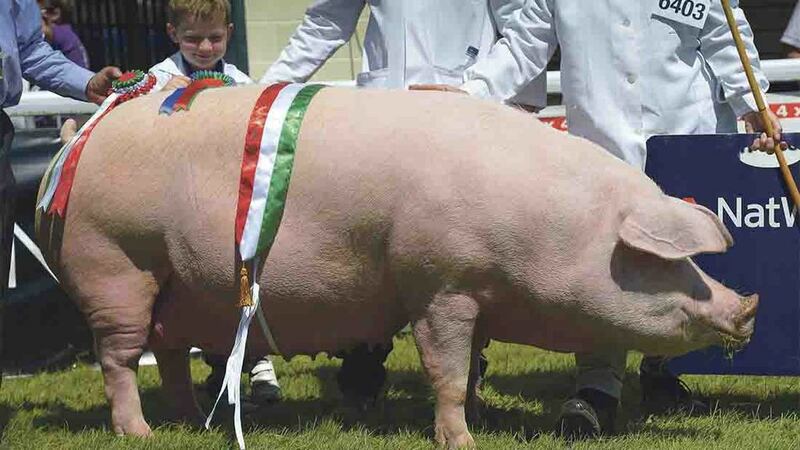 AFTER a 20-year wait Gerallt and Joyce Owens and son, Llyr, took the inter-breed pig championship. Mr Owen, who had been showing at Welsh since he was a small boy said they last won the supreme title in 1996. Their winner this year was a July 2013-born Landrace sow, Sunrise Vega, which was bought as a gilt privately from Steve Loveless. This marked the sow’s first major show win and it will now return home to Llanelli, Carmarthenshire, for farrowing in three weeks time. The Owens have just the one Landrace, two Welsh sows, along with 200 breeding ewes. Reserve was a September 2015-born Welsh boar, Gwynys James 1892, from Huw and Ela Roberts who have 25 pedigree Welsh breeding sows at Pwllheli, Gwynedd. Being shown for the first time the boar will next head to Angelsey show. The Roberts’ also won the reserve inter-breed title at last year’s show. Inter-breed (B. Upchurch, Hertfordshire) Sup., G.L. and J.E. Owens and Son, Sunrise Vega (Landrace); res., H.D. and E.M. Roberts, Gwynys James 1892 (Welsh). Inter-breed pairs (B. Upchurch) Sup., H.D. and E.M. Roberts, Gwynys James 1892, Gwynys Model 582 (Welsh); res., D. Perkins and L. Georgiou, Gwyndy Grand Duke 7, Gwyndy Lucy 15 (British Saddleback). Welsh (B. Mulkeen, Wigan) Sup. and male, H.D. and E.M. Roberts, Gwynys James 1892; res. and fem., D.T. Evans, Goldfoot Lucky Girl 1277; res. male, E. and A. Roberts, Gwynys Victor 2017; res. fem., Hideaway Farm Meats, Hideaway Willing 362. Any other modern breed (B. Mulkeen) Sup. and fem., G.L. and J.E. Owens and Son, Sunrise Vega; res. and male, C. Taylor, Hideaway Danny 428; res. fem., L. Nicholas, Dukes Beautiful; res. male, G.L. and J.E. Owens and Son, Lletty Hamster 2. Tamworth (B. Mulkeen) Sup. and fem., S.Nicholas, Fairybank Melody 9; res. and male, B. Warren, Courtbleddyn Jasper 19F; res. fem. B. Warren, Courtbleddyn Jacqueline 10; res. male, S. Nicholas, Fairybank Dreamboy 5. Saddleback (B. Mulkeen) Sup. and fem., M.G.W. Trumper, Beiliau Dinah 19; res. and male, D. Perkins and L. Georgiou, Gwyndy Grand Duke 7; res. fem., D. Perkins and L. Georgiou, Gwyndy Lucy 15; res. male, D. Perkins and L. Georgiou, Gwyndy Grand Duke 9. Any other traditional breed (B. Mulkeen) Sup., J. Collings, Liskeard Charles 28; res., M. Smith, Cosscoombe Primrose 11.